Flashnord.com reports that a Murmansk woman has recently suffered a food poisoning as a result of eating a store-bought salad. What was left of the salad was subject to expertise that found the sperm of six men in it. No further details are available in the press except that the victim declined to press charges. Hope the following gets a chuckle out of you. Too bad “sniffing” it with a piece of brown bread was not included, the hard-core drinker style. Was pointed to this review of the advantages of getting the Russian citizenship and steps in the process described at nomadcapitalist.com. In all these years I’ve only had one client who went through it in the relatively liberal 2000s, and it took him a year of full-time work, and by the time he got his permanent residence he came to hate the country and returned to the States in disgust with Russia. Still, I get this question once in a while, and reading this article may be a good place to start. Too bad but our wonderful tenants of two years are leaving us. Thus this Moscow apartment is available for rent starting beginning of July 2015. 5-7 min. 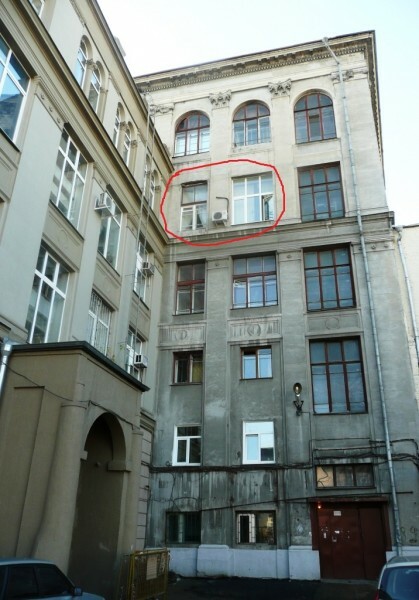 from Red Square, 2 rooms + loft, air, washing machine. Long-term only, 55 th. roubles/month including utilities. The building was put up by the vodka oligarch Smirnoff in 1903. Window of our apartment, looking onto the canal, are circled in red on the photo above. The building has its own website, where you can get acquainted with it more closely. The apartment is quiet, cozy, and charming. Ideal for academics and creative types. All the conditions for intellectual and creative work, as well as romance. For years I’ve been renting this place out to travellers from abroad, short-term. In the last two years an artistic couple from St. Petersburg, Xenia and Leo, have been occupying it. You can speak with them on how it is to live there. In view of the fact that apartment owners (us) are presently far from Moscow, we are looking for long-term tenants who will appreciate the location and the apartment itself, quiet and reliable people, with whom we could transact over distance. Children and animals are welcomed! We’ll be happy to answer any questions. Write to manfriday@yandex.ru. Tell us something about yourself. It is important for us who lives there. No agents please. Do not write to us. Under no conditions will we deal with an agent. Ceilings 4m. Large windows overlooking the canal. Very quiet.